Besides providing hotel rooms, we also specialize in long term stays. Our apartment is starting from $149 per night plus tax. 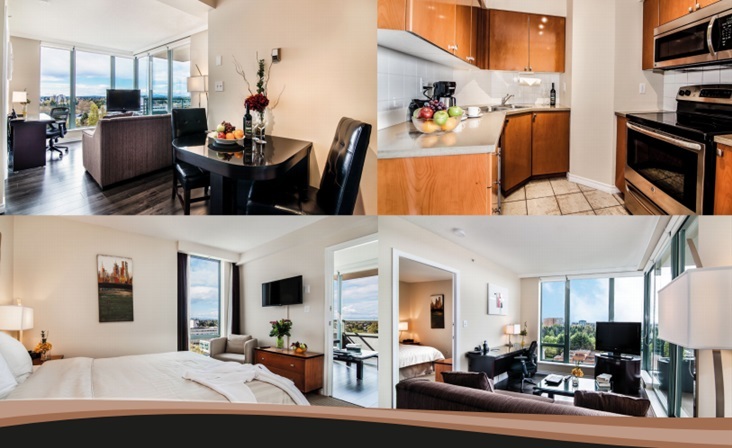 The Executive has long been the preferred choice for business & leisure travelers requiring full service hotel facilities close to the Vancouver International Airport, offering a choice of 290 rooms, suites and luxury apartments. For extended stays and for families and friends traveling together check out our luxury furnished 1, 2 and 3-Bedroom Apartments featuring full kitchens and separate living rooms. We offer 16 meeting and conference rooms seating from 10 - 800 people and over 17,000 sq ft of versatile space for trade shows, conventions, seminars, weddings, board meetings and auto shows. The Executive is located in close proximity to Richmond's business centre and shopping malls and is 5 minutes to the Vancouver International Airport, 5 minutes to Brighouse Station - Canada Line Skytrain and 15 minute drive from downtown Vancouver. Stress-free Parking: Secured parking structure on site plus parking around the hotel.